"It was a 63-year-old friend, Maria del Carmen, who called me the week-end after Ash Wednesday to tell me that she had seen an apparition on a Mexican TV station and that the apparition was nearby. I asked her where it was, and she told me that it was in Thermal, California, a little over one hour from where we live. I was surprised, but I did not take the initiative to go. Inside I just kind of felt that maybe the rain had formed a cross design and that people were probably exaggerating and making it out to be bigger than it was. I ignored it. One week later, my same friend, Maria Del Carmen, called me in almost total hysteria to tell me that her friend Rita had driven her up to see the cross at the apparition site in Thermal. My husband and I went to her home (her home, by the way, is a shrine to Our Lord, Our Lady and all of the angels and saints, you should see it), we took her out to dinner and there she told us.."You must go, and you must go now, before it disappears....please go, and take me, I have to see it again!!!!" I promised her that we would go. On the following Saturday, I called my friend "Pancho," the one who leads the monthly Medjugorge Rosary, some friends, and Maria Del Carmen.....we were headed out that way, we were going to see the Miracle for ourselves. As we were driving up there, I was excited and full of anticipation. By now, I had seen the picture of the Cross on your Web site Spirit Daily and so I knew (or so I thought) what to expect. Finally we are driving closer and closer to the apparition site. We make a right turn at Airport Blvd and an immediate right into Fillmore Road. We drive into a dirt road surrounded by very old mobile homes tucked among date groves and beautiful orchards, and there is a cardboard sign that reads "no donations please." We park outside on the dirt and then walk into another dirt area. Someone welcomes us and tells us that its the "last mobile home" on the premises on the left hand side where the "miracle" is. As we are walking in, everything looks very humble and there is a "peaceful" feeling that I got as I was approaching the miracle.....and finally as we approach the home, a lady by the name of "Adelina" welcomed us. She is the daughter-in-law of the owners of the mobile home. 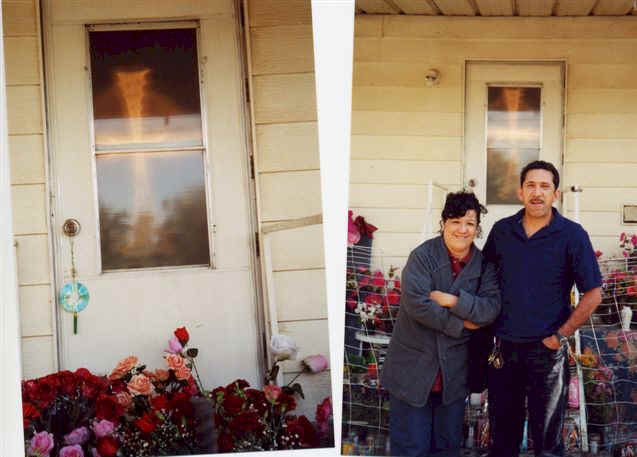 She said that the Cross of light first appeared to her husband, Jesus Aceves. It was he who first saw a "light" descend from the sky, move down in front of him, and then placed itself on the door of the mobile home. Adelina was wonderful. She welcomed us and told us to walk to the back of the mobile home. And so, I waited and waited until 7:00 p.m, but at this point, someone started to scream outside of the house telling everyone that other "crosses" were starting to appear on Emerald Street and Dillon Avenue in the town of Indio, and so I decided to drive out there to see that was going on. Michael Brown, as I walked up to these streets, there were many people going from house to house. All of the owners of the homes close by were welcoming anyone and everyone to see what had happened in their homes also. These are humble Mexican and Mexican-American people who have always had statues of Our Blessed Mother in their front yards and purchased their older homes back in the 1970s (as you can see from the pictures). Their miracles also appeared on Ash Wednesday and sure enough, the crosses are there on their windows, but smaller than the Cross in thermal. Everyone is asking why Indio? Why Thermal? What does all of this mean? 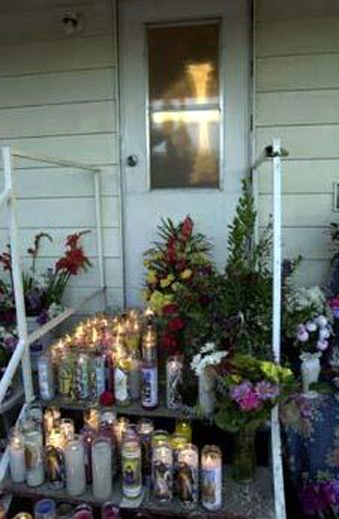 After a few hours, I drove back to Thermal, and there was a line of over 125 people, waiting to see the Cross appear on the inside of the Aceves home. I was in the middle of this line and it took me two hours to get into the Aceves home. 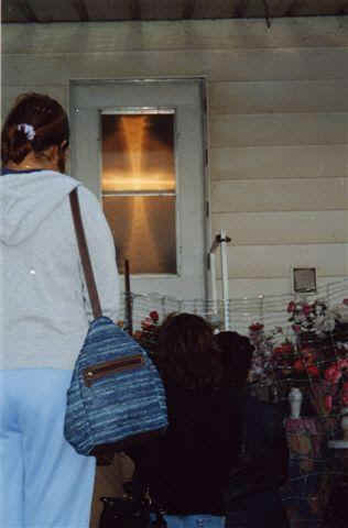 When I finally went in (remember, I had already seen that there was nothing to see from the inside during the day when Mrs. Aceves allowed me into the home) all of the lights were off and people inside were praying the Rosary. When I walked into the laundry room at night, There it was, a huge Cross, and so I decided to put my forehead on the window of the door/from the inside) to see what I could see. Michael Brown, I could see "another dimension" with the Cross suspended in space and the bottom of the Cross seemed to be going in eternal directions on all ends. It was something I will never forget in my lifetime. It was if the Cross were located in "another world" that was not Earth and that we were being allowed ro see this incredible miracle. I don't know how else to explain it. My husband Sergio accompanied me to see the cross one week later and says that the window has been designated to be "a window to allow our eyes to see the gift of The Cross." He feels that there is no apparent obvious illusion or trickery being used. He says that if someone can prove that a light bulb can actually produce a cross like that, then "I want the patent to that" because no regular light bulb can do that. He says that it would take thousands of dollars in laser light and computers to even think of coming close to achieving the effect of the cross that is on that mobile home. The only thing that the Aceves family has on in the day is a regular 50-watt light bulb, like they have always had before the apparition. The following weekend, my husband and I went back again and after viewing it from the inside again, someone took a picture from the outside and you were able to see the cross from the inside, white. On seeing it from the outside, when people were taking pictures, as soon as the camera "flashed" the cross would turn Red or Green, or Blue and even White.